Last week I was bellyaching about how dissatisfied I was with my paintings, and Fate apparently paid attention, showering me with encouragement this week. Just a little, no “tens” on the ten-point encouragement scale but maybe, considering all, a solid seven. First, I partook in the 4th Annual Essex (Massachusetts) Paint Out on Saturday. It was my first foray into this event but I had heard that the auction was widely supported. We painted Saturday and handed in the wet paintings before leaving Essex to go home. On Sunday we returned (I was already in Gloucester for my Figure in the Landscape workshop with David Curtis) for a Silent Auction (4-6) and a Live Auction (6 -7). About 18 works had been preselected for the Live Auction–works by popular local artists. About 100 paintings were entered in the silent auction. 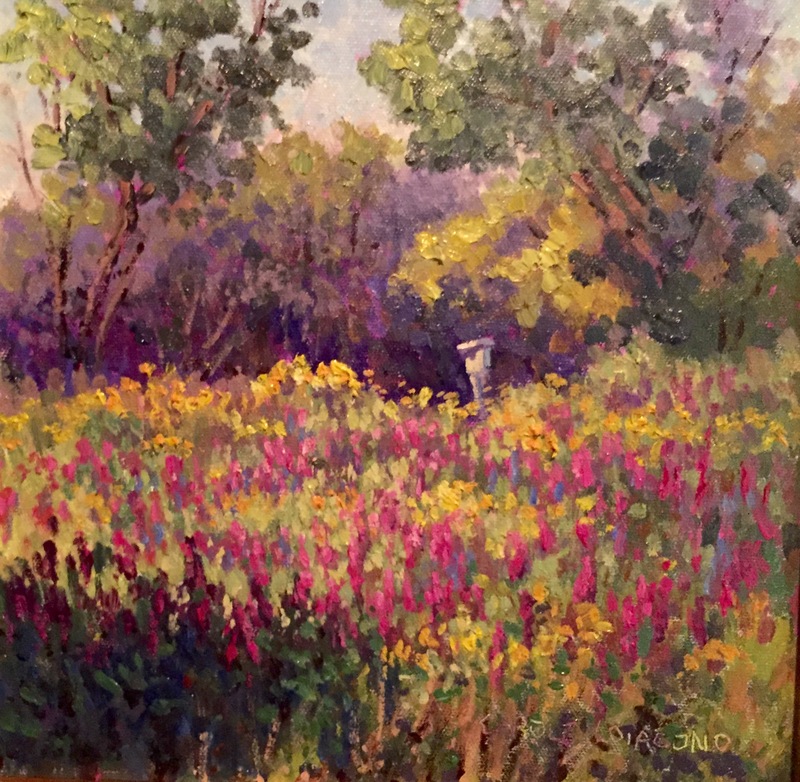 Here’s how a silent auction works: the artist declares a value for the painting (in my case, $325 for each 9×12 wet painting, unframed); the authorities (actually, some computer, they alleged) use that value to peg the minimum/opening bid (in my case, $125). Each painting is accompanied by a bidding sheet. The top line states the opening bid. A bidder writes his/her name on that line. Thereafter, other bidders could come along and bid higher by writing their names on the next line, and stating the higher bid next to their names. The first bidder must lurk in the area, watching for such an eventuality so as to strike back with another bid if he/she really wants the painting. So that is the Sunday scene. Now back to Saturday. Flo Parlangeli and I sought out a scene with marshland (for her) and buildings (for me). Based on a tip I got at registration, we drove to the end of the appropriately named Water Street. 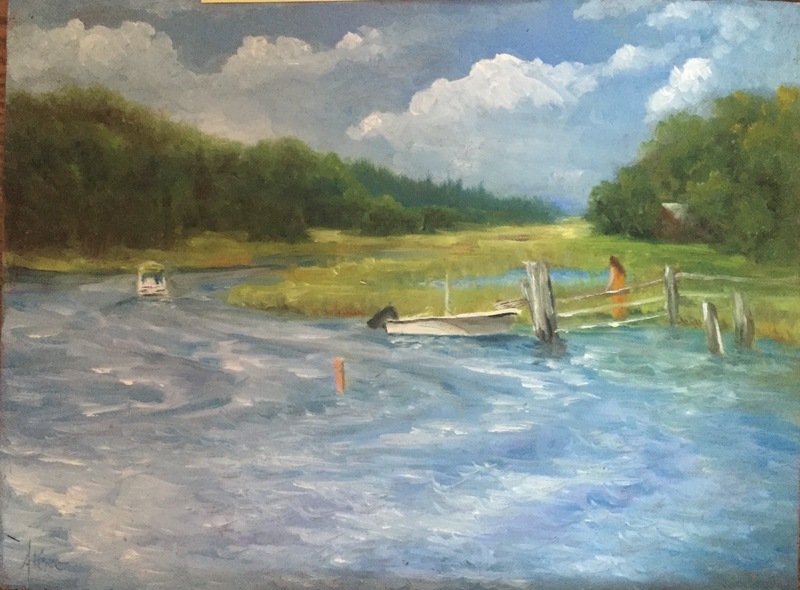 From there, we had a view upriver (the Essex River) to the Town of Essex (buildings, including a steeple, de rigeur for a New England town), and a view downriver toward the bay, eventually toward the ocean. Downriver was Flo’s choice. The edges of the Essex River are very marshy. Its pace looks relaxed, and its path meanders and splits off to form separate pools here and there. When the tide is low, mud flats are exposed. The Town is celebrated for its clams, dug out of those mud flats. We were welcomed by two brothers who had inherited the house at the end of Water Street, and encouraged to go anywhere on their land, either side of the road, despite the No Trespassing signs. They also regaled us with inside stories about our location and the town. The bottom of Water Street had once been called Callahan Point, Callahan being their great grandmother’s maiden name, or Clay Point for the industry of brick making that once thrived there. Associated buildings are long gone and the land is now all under conservation never to be despoiled again. Soon we were joined by another artist–from New Hampshire! Total coincidence. She was a pastelist and left after lunch, never to be seen again. We looked for her painting at the auction but could not find it. I suspect she was a victim of Dissatisfaction. Speaking of lunch . . . Wow! I volunteered to go collect the lunches for all three of us since I had finished my first painting. That turned out to be quite a project. They served clam chowder (of course), tossed salad, sandwiches of every description, homemade chips, cookies, water and condiments. I had to choose what kind of sandwiches and figure out how to transport three lidless clam chowders cups to Water Street. Flo was working all day on one larger piece looking downriver, and didn’t finish until about 4 o’clock. With that extra time to think, it occurred to me that between us we had two extra tickets to the auction event, so we offered those to our hosts. One of them said he would bid on my upriver painting, and indeed he did, and he won it for the opening bid. 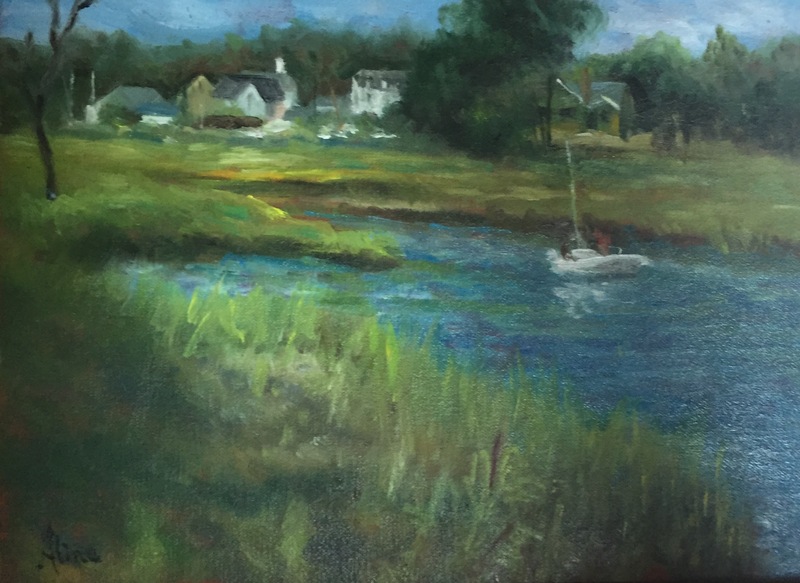 My other, downriver, painting also sold, to a local art photographer whose stunning sunset-over-the-marshes view was in the live auction. (Unless he got outbid–I have not received any word yet of the final bids.) Unfortunately, Flo’s painting did not find a bidder. Indeed, a quick glance around the barn of the items up for silent auction suggested that less than half were finding bidders–not exactly what had been anticipated based on prior years’ performances. I suspect the large format of Flo’s painting might have put off savvy buyers, who are all too familiar with the cost of framing. We stuck around for the live auction, at first because David Curtis had one in it and I thought I might get a David Curtis painting for an unrealistically low price–what a coup that would be! However, I fell in love with a different painting and had to go my limit ($300) to get it. This artist spends half the year in Florida, apparently. I guess she was not at the auction. Neither was David Curtis, and by the time his piece came up for bidding, I had “shot my wad”. Sorry, David. 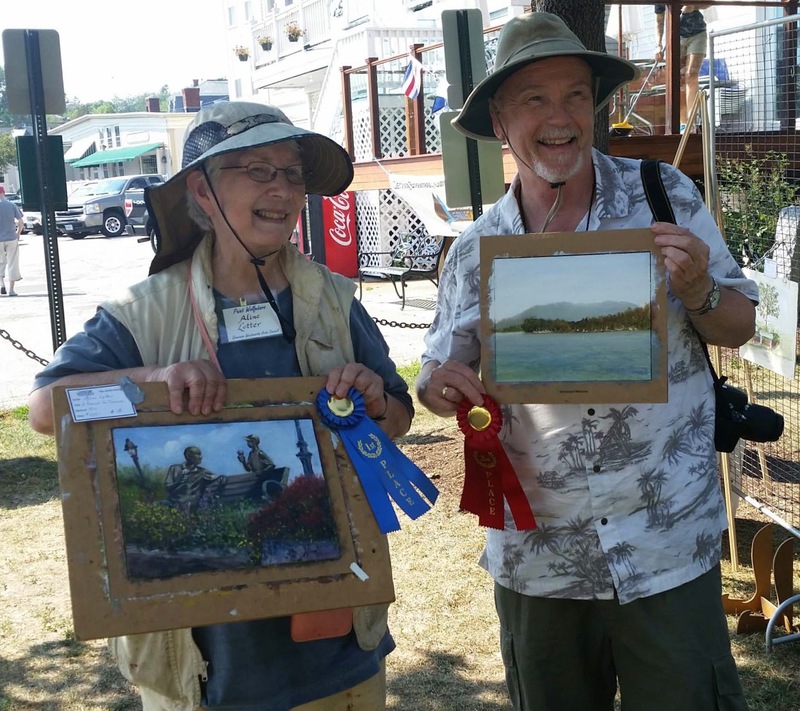 Riding on the crest of my Essex success, yesterday I embarked with Sharon Allen and Jim O’Donnell on trip up to Wolfboro for the annual paintout sponsored by the Governor Wentworth Arts Council. This paintout also ends with a sale of some sort, sometimes an auction, other times, a straight sale. One time, I sold in the silent auction format–$100 for an unframed 8×10, which I had to split with the host organization. My buyer that year had guarded my painting so that no one else could get near the bidding sheet to compete with her. I didn’t really mind, because it’s not about the money for me. I was flattered. This year we were allowed to set a price, and to be consistent, I put the price of $325 on my 9×12 painting. Yes, only the one painting. We had to turn them in at 2 o’clock and I had picked a difficult subject that took almost all of the 4 hours available to me. There were no buyers for $325 paintings. $60 paintings, yeah. I would have attributed my failure to find a buyer to buyers choosing against me, but for the fact that I WON People’s Choice!!! I now know how Sally Field felt accepting the Academy Award for Norma Rae. I had not even voted for my own painting, assuming it wouldn’t even be in the running. Instead I voted for Jim’s excellent painting of the water vista. And Jim came in second! I am so glad I voted for him. Fate rewarded me. My painting was of a statue in Cote Park called “Sharing”. 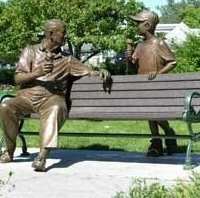 It features two bronze figures and a park bench, which visitors use like a bench for photo opportunities. If only they’d stay long enough for me to incorporate them into the painting. 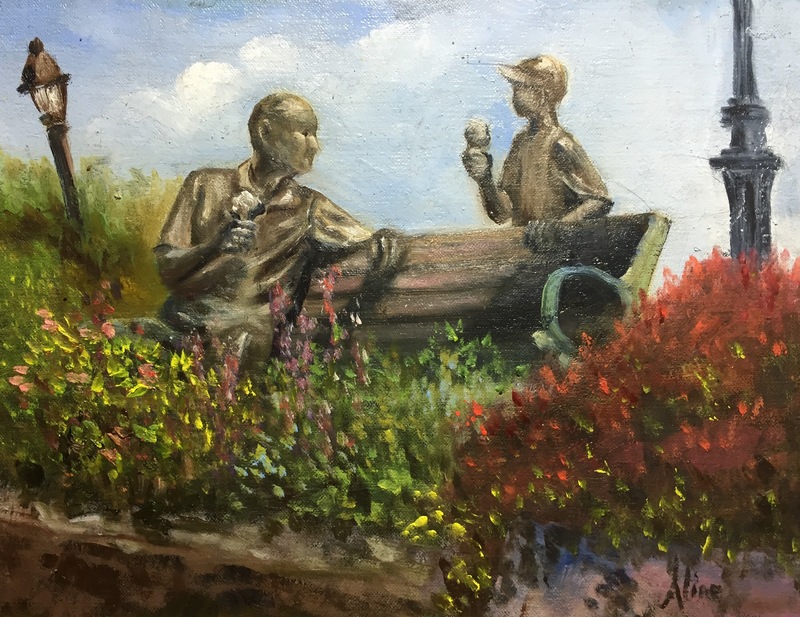 The title of the sculpture must refer the “sharing” of the experience of eating ice cream cones by grandfather and boy. It should be noted that there is a place to buy ice cream down at the docks. After handing in my painting, I availed myself of a cup of something chocolatey. A rather large cup. Turns out, I deserved it!